Philadelphia 76ers center Joel Embiid drives to the basket against Brooklyn Nets guard Rondae Hollis-Jefferson in the second quarter at Barclays Center. Often times, all you can say about a mid-March game in the NBA is that it was a straightforward, nondescript win. There are no standout performances, no major highlight plays, just two teams headed in opposite directions in the standings, doing exactly what you thought they'd be doing. The Sixers have grown accustomed to playing in these sort of games, but it has been a while since they had a season where they were on the positive side of the coin. 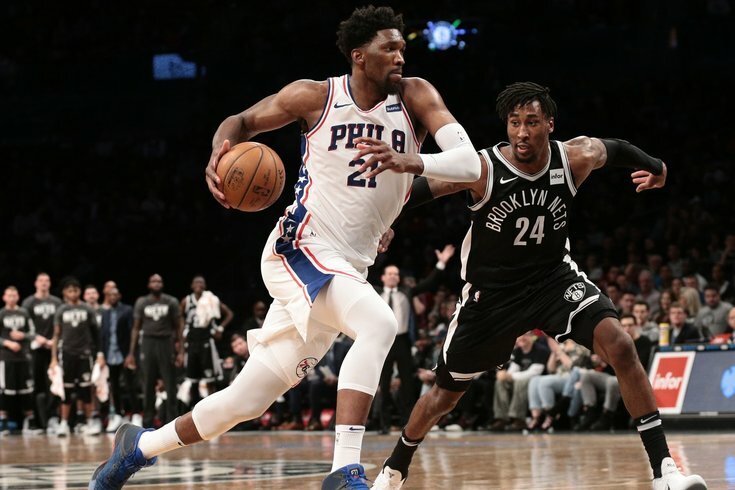 Their 120-97 victory over the Brooklyn Nets was comprehensive in every way, and after a series of disappointing performances, it was a step back in the right direction for Philadelphia. Following his best game in roughly a week and a half, Embiid was pulled aside by NBCSN's Molly Sullivan to talk about the blowout victory. Sullivan brought up a topic on everyone's minds in Philadelphia, asking Embiid what he believed had been going wrong for him during a recent cold spell. For those who wanted to blame it on fatigue, Embiid pretty much waved that suggestion away. "I don't know, it happens in an NBA season. I don't think it has anything to do with fatigue," said Embiid. "I wasn't tired. I was just frustrated with the way we were playing. But I want to build up on a night like tonight and hopefully keep getting better from here." Score one for the people who didn't think fatigue was the root cause of a poor stretch in the first place. But the big difference for Embiid was not getting an extra day of rest between games or the number of touches he received on offense, and was more about how he went about his work on Sunday evening. Embiid took and made a decent amount of jumpers against Brooklyn, but there was a concerted effort on his and the team's part to get him looks closer to the basket and as early in the shot clock as possible. When things are going well for Embiid in the scoring department, he's usually getting his shots up right in the middle of the countdown from 24 — he shoots 54 percent on shots in the area between 15-7 on the timer, per NBA tracking data — but getting him the ball early helps alleviate some of the hero-ball tendencies that show up in late-clock situations. Apparently unsatisfied with the number of looks he was getting early in recent games, Embiid basically forced his teammates to get him the ball against Brooklyn. After hitting a couple early jumpers, the Sixers used Marco Belinelli to backscreen for Embiid and make his catch easier. Poor Dante Cunningham never had a chance from there. This is the sort of thing some Sixers fans want to see Embiid do on every single possession, but Sunday night was a rare occasion in which it made sense to do so. Brooklyn doesn't have the size to offer much resistance on the interior and Embiid doesn't have to take a beating to put his work in down low. And besides, the ideal version of that play wouldn't have ended with a post move. The Sixers ran that exact same play later in the first half, only this time with Redick screening Embiid's man. He wiped Jarrett Allen out of the play and it was never in doubt for Embiid from there. We've discussed Philadelphia's need to get Embiid easier shots through pick-and-roll creation, but this is another part of the formula. When all you have to ask your big guy to do is deposit an open shot at the rim, you can't really draw up better offense than that. The Sixers need to keep Embiid on a steady diet of these plays, because lightening his workload on the offensive end frees him up to anchor the defense as we all know he's capable of. It was not a monster night at the office (21 points, eight rebounds, 3 assists on 9/17 shooting) but it was a major improvement from his past week. Buying him some extra rest at the end of the game with a blowout win is a nice bonus, too. His teammate, Dario Saric, has been the poster boy for making Philadelphia's offense work by any means necessary. So if Philadelphia can continue generating offense for Covington by using him as an off-ball cutter, it will increase his utility in the starting group. Coming off what was probably the worst offensive game of his career, Covington rebounded nicely with 19 points against the Nets. Attacking the rim isn't usually a strength of his, but a lot of that is because his shots there come off erratic drives. Turning his handle into a clean look at the basket is not the easiest thing in the world. With his combination of length and athleticism, he should be plenty capable of finishing as long as that's all he's being asked to do. Covington did an excellent job of moving without the basketball against Brooklyn, turning the threat of his three-point shot into opportunities to create separation from the defense. Though his team needs more self-creation up and down the roster, the Sixers would be thrilled if they could get this out of Covington more regularly. He has a dominant post player and a passing savant capable of hitting him on the move, and that's before accounting for Saric and McConnell. There's no reason he can't get a few baskets a game on plays like these. He had the jumper going tonight too, but the Sixers can work through his tough stretches from deep if they simply get him involved more as a cutter. In many ways, this was the quintessential McConnell game. He had three steals against Brooklyn in the first quarter alone, including a strip in the backcourt in the final minute of the first quarter that led to one of the best sequences the team has had all season. Their overpassing is often to their own detriment, and in his heart of hearts I imagine Brett Brown might have felt he'd rather Redick just shoot the top-of-the-arc three in that situation. But the result was some great team basketball and it all starts with McConnell making a play at the margins of the game. It remains insane that opponents still get their pockets picked on these plays when McConnell is in the game, because they have to know it's coming. I understand he's pretty far down the scouting report when it comes to preparing for Philadelphia, but come on! If you squint a little bit, McConnell's impact on his best nights could be used as something of a case study for why Richaun Holmes might deserve a bigger role than he has currently. Certain guys make plays or carry themselves with a swagger that their teammates are visibly inspired by. Holmes and McConnell are cut from the same cloth in that respect — when you watch Holmes scream after a huge dunk or McConnell get in a teammate's face after a big defensive play, even us schlubs watching from the sideline get a little fired up. The Sixers have had to live through some tough nights for McConnell recently, but he's not a guy you count out of a fight. It showed up in the box score (10 points, six assists, four rebounds, four steals) on this night, though it would have come across on Sunday no matter what the final line ended up saying. It should be no surprise, then, that the bench had their best collective game in a while. McConnell has a big hand in how the bench lineup fares from night to night, and with their emotional leader cooking the rest of the guys followed. Every single bench player that got major minutes on Sunday — a group including McConnell, Ersan Ilyasova, Marco Belinelli and Richaun Holmes — ended up on the positive side of the +/- ledger, and in most cases by a large margin. They all offered different bits and pieces to the victory, and this is the sort of performance they need to use as a platform for further success. It has been said over and over again throughout the year, but it's worth noting again here: of lineups that have played at least 300 minutes together this season, Philadelphia's starting group is the best five-man unit in basketball. They outscore teams by a margin of over 17 points per 100 possessions, posting elite numbers on both sides of the sport. There are ebbs and flows like there are with any group, but on an average night, they do more than enough to win. That means all the Sixers really need is a semi-reliable bench group behind those guys. That has been impossible for most of this season, as Brown made an effort to give everyone a crack at playing while trying to find combinations that worked. Now that they have pieces on the bench that fit what they need, things are starting to solidify behind the starting group. If they can make it hold, that makes Philadelphia a much more dangerous team when the playoffs roll through. If I wanted to turn the observations posts into a running series complimenting Saric's game, I could probably do it. It is hard to overstate how successful his second NBA season has been, and the sheer variety of what he does on a moment-to-moment basis is pretty incredible for someone who doesn't dominate the ball. Depending on the situation, Saric is asked to play completely different roles. When the offense is being run through Embiid, he's a floor spacer and a damn good one at this point. If Simmons is toting the rock, Saric might be cutting off his post-up or offering him a perimeter outlet, either to recycle the offense or take a shot of his own. And he's doing all kinds of work of his own when the big-name guys need to take a play off or spend time on the bench, with the bruising forward capable of manipulating defenses from the low post and the three-point arc. A lot of this comes down to a simple reality: this dude puts in the work. That applies to the practice sessions where he continues to let his jumper fly the same as it applies to his motor within a game. You still see his athletic limitations hold him back on the defensive end sometimes, but it's never because his compete level has dropped. If there's a reason the starting five has worked way better than expected when Saric was added, it's the man himself. He creates plays out of nothing sometimes, not letting opponents take something as simple as a defensive rebound for granted. We'll discuss Saric more in-depth soon, but his development has been and should be one of the biggest stories of Philadelphia's season. He has asserted himself as a pivotal figure in their leap up the standings, and will likely be a fan favorite for years to come.